The 2019 edition of VEDECOM to the Future, the Institute’s internal Corporate day, took place on Thursday 21 February at mobiLAB. Recently installed in these brand new premises, VEDECOM used the occasion to celebrate its 5-year anniversary with all its employees. The annual VEDECOM to the Future day began in a relaxed and friendly atmosphere for all of the Institute’s employees. Following the traditional welcome over coffee and a croissant, the work groups formed at the 2018 session were invited to report back on the results of their year’s reflection. All the participants were then given a badge and a logbook as they split into teams to go and explore their new building by means of a treasure hunt making use of their artistic, literary, scientific and sporting talents. It was an opportunity for everyone to get their bearings a bit more in the maze of corridors and different levels of this 7,100m² building, of which VEDECOM occupies 75%. The gallant treasure hunters returned at lunchtime ready to start the afternoon in a plenary session. 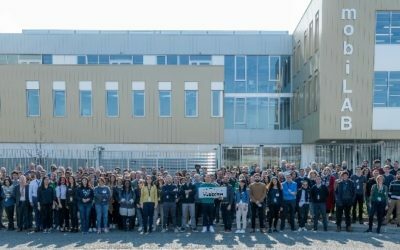 The employees gathered in the PSA Motorsport auditorium, whose buildings adjoin mobiLAB, to attend the dynamic presentation by the positive conference speaker Yves de Montbron who spoke about optimism. “When we think positively, we can find solutions to everything,” emphasised the speaker who maintains that optimism is primarily a state of mind. 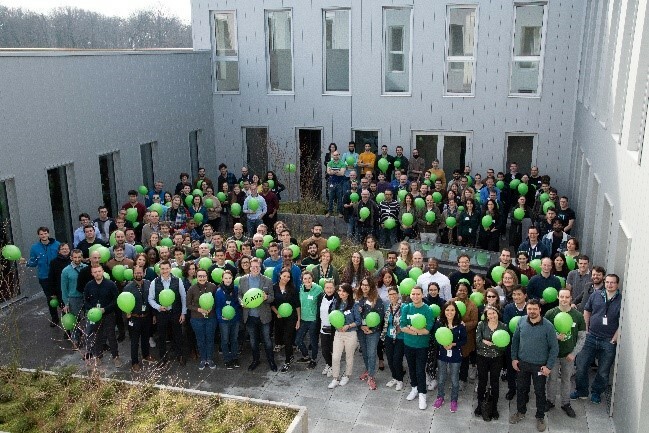 A theme in tune with this group of researchers and the rapidly growing Institute which, 5 years after being founded, has almost 200 employees, half of whom are under 30 years old. The day finished with a birthday cake to celebrate five years of VEDECOM and honour its longest serving employees. On 11 February 2019, VEDECOM, the French department of Yvelines, and Rambouillet Territoires signed a partnership agreement to conduct studies on the train stations in Gazeran and Rambouillet. The goal was to identify current and future parking opportunities to promote intermodal transportation. 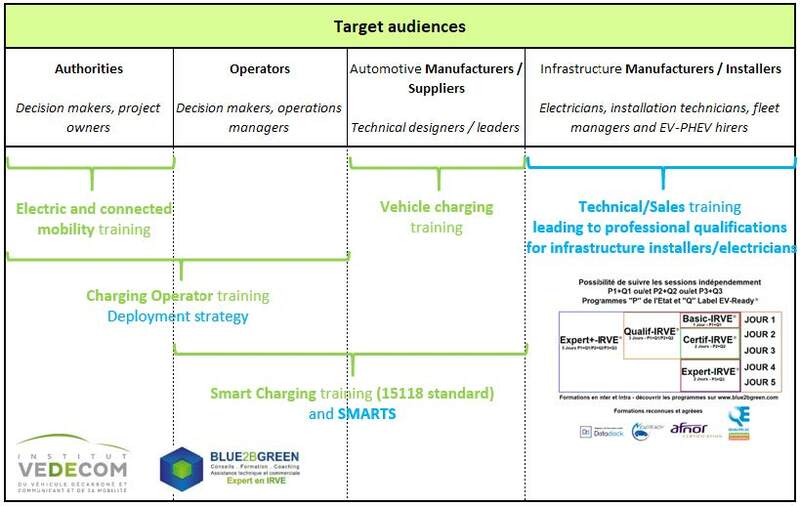 In time, this work should also help optimize product offer and transportation management strategies in rural areas within Yvelines, which are typically located far from service and employment centres. 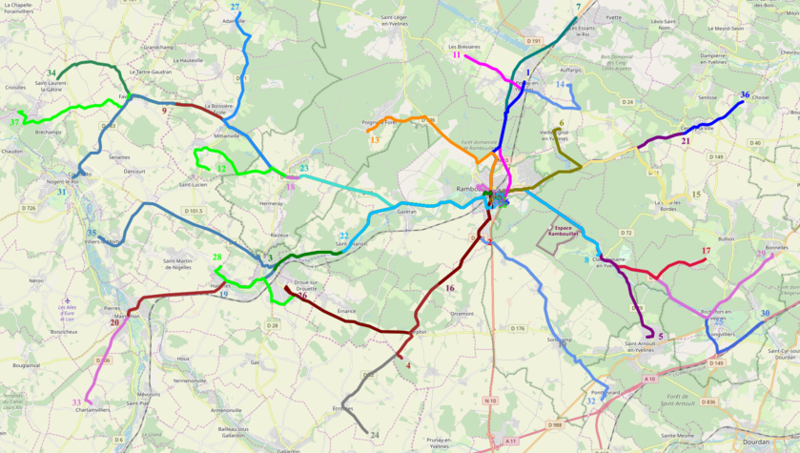 Residents of these areas do not regularly use intermodal transportation methods. This experiment uses Altaïr Mobilités, an innovative decision-making tool developed by the VEDECOM Institute. This multi-source solution uses ground-breaking AI technologies to combine the diverse range of mobility data that are now available, including GPS data from cars, demographics, public transit ticketing information, mapping, smartphone applications, and more. This agreement is part of the Department of Yvelines’ work to facilitate the roll-out of innovative mobility services through its region. The department has provided the VEDECOM Institute with 20 million euros for the 2014-2023 period. 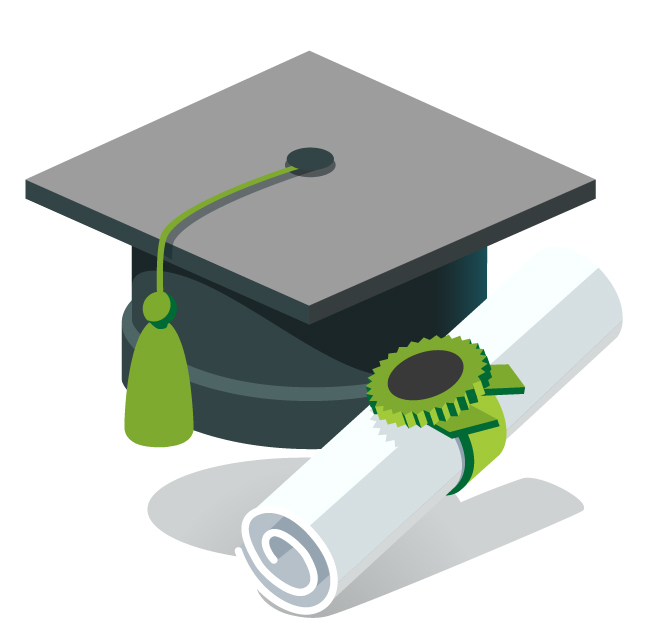 VEDECOM is very pleased to announce the defense of the thesis of Mohamed Ryad BOUKHAR on Tuesday 5, February 2019 at ESTACA Campus-SQY. 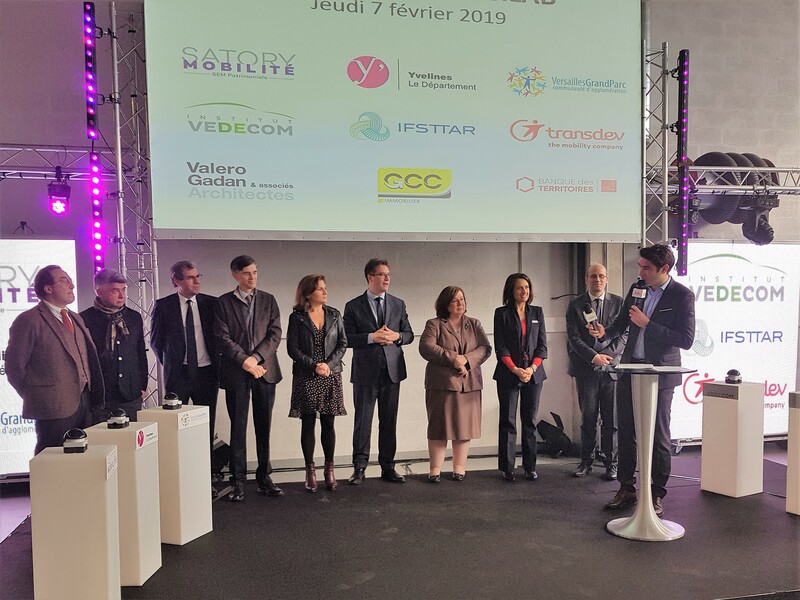 The mobiLAB was officially opened on 7 February by Pierre Bédier, President of the Department of Yvelines, François de Mazières, President of the Urban Community Versailles Grand Parc, and Marie-Célie Guillaume, CEO of Satory MOBILITE. Representatives from Banque des Territoires, GCC Immobilier and the architectural firm Valero Gadan also attended. This was an important symbolic event, unveiling this 7,100 m² property complex as a showcase for the Versailles-Satory innovative mobility cluster. On Thursday, 7 February, in brilliant sunshine, the golden buildings of the mobiLAB welcomed some 200 invited guests for its inauguration. The four-storey complex includes research facilities, laboratories, workshops and offices, all in direct proximity to the test tracks and to other mobility stakeholders such as Renault, PSA, Arquus and Nexter. 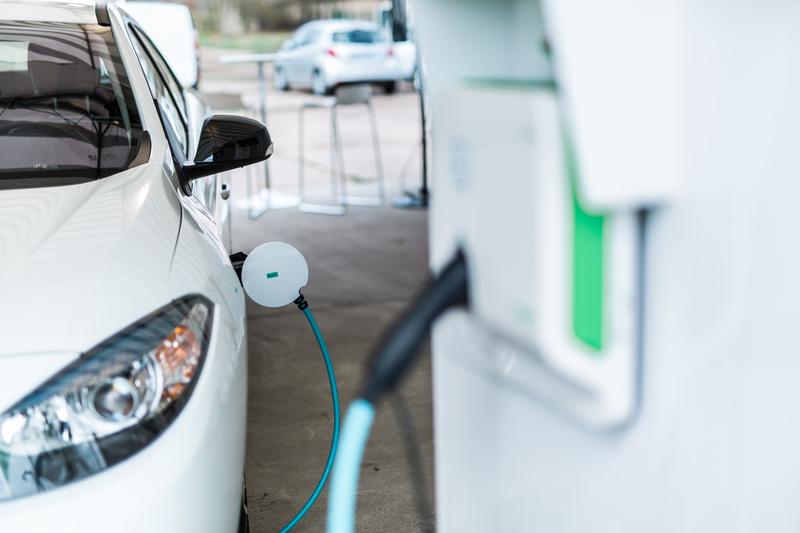 It is one of the first concrete realisations of the global project to develop an innovative mobility cluster within the centre of excellence that is Versailles-Satory. The complex is now home to the three major stakeholders VEDECOM, Transdev and IFSTTAR (the French Institute of Science and Technology for Transport, Development and Networks), which has occupied premises at the site since 2009. Eventually, nearly 300 researchers will work side by side at this unique research centre. “Our goal is to keep pushing forward to establish this cluster, based around the mobiLAB. 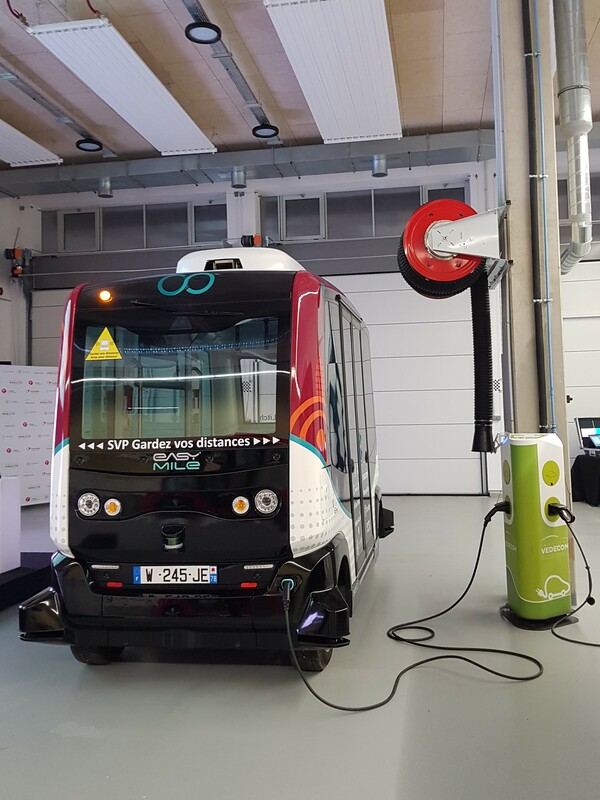 We want to see these companies working together towards the common aim of developing innovative mobility projects”, explains Marie-Célie Guillaume, CEO of the semi-public company Satory MOBILITE, which has invested €17 million euros in backing the project. 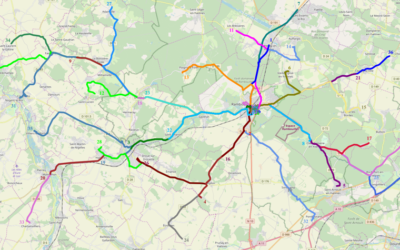 Born out of a partnership between the Department of Yvelines and the Urban Community of Versailles Grand Parc, with links to a number of private stakeholders, the long-term purpose of the semi-public company Satory MOBILITY is to develop property solutions on the Satory plateau for all stakeholders of the automotive research ecosystem. The company opted to build this first project with the property developer GCC Immobilier, one of the top ten building and civil works companies in France. The building design contract was awarded to the architectural firm Valero Gadan. 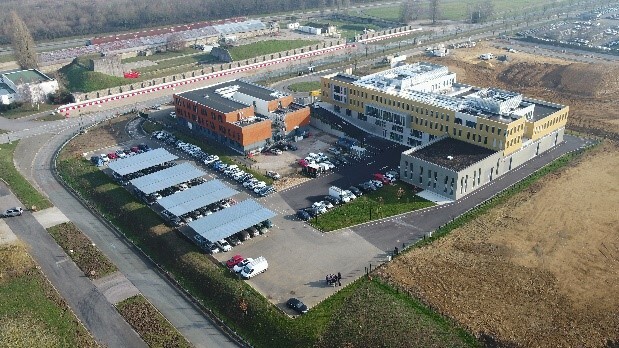 With handover completed in October 2018, the mobiLAB became the head office of the VEDECOM Institute in November 2018. With its 200 employees, the Institute is using 75% of the building’s capacity. According to Managing Director, Philippe Watteau, “With the vast majority of VEDECOM staff now working under the same roof at Versailles-Satory, the mobiLAB is for us a real enabler of internal cooperation and innovation across our entire ecosystem. It also raises the profile of our activities and gives much greater recognition to the work of our staff”. 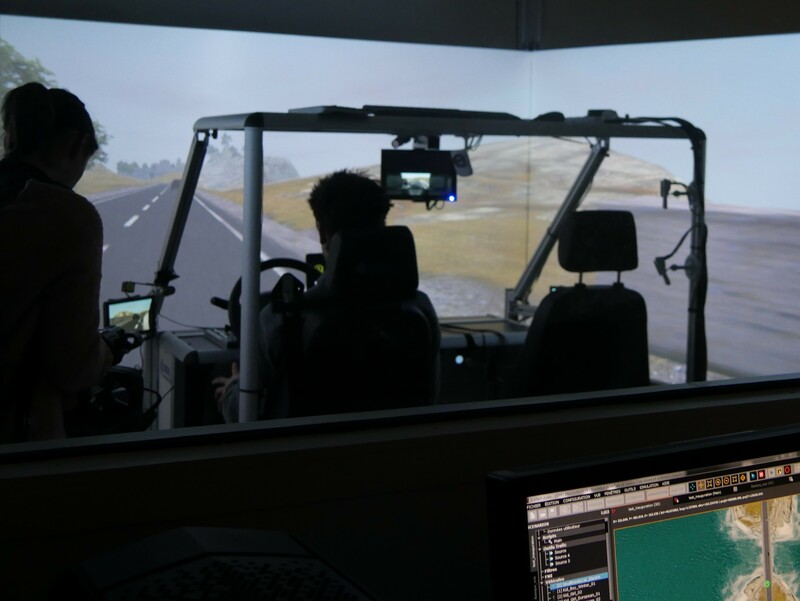 Designed as a shared centre of excellence and a hub for collaborative research, VEDECOM now enjoys access to the high added-value facilities at the mobiLAB: 790 m² of workshops, 215 m² of laboratories, two simulator rooms (pedestrian simulator and driving simulator), a Connectivity and Monitoring lab, two training rooms. Added to this are the workspaces shared with IFSTTAR: 530 m² of workshops and 30 m² of laboratories. At a stone’s throw from the mobiLAB, the Institute also has facilities alongside the test tracks. Hall A houses a power electronics lab, a Fab Lab dedicated to electric machines and another to autonomous vehicles. VEDECOM has developed the world’s only induction charging track and characterisation test bench for inductive research. It also has use of tracks for testing autonomous vehicles. The addition of a walkway linking the mobiLAB to the tracks and laboratories is planned for the near future. An outstanding facility to help accelerate the autonomous vehicle from fantasy to reality!